Summary: This range of Fitness Mad colour-coded vinyl kettlebells start at just 4kg and go all the way to 24kg. You can buy a set or take them individually. The vinyl coating does more than just brighten them up, the impact of dropping them on your gym floor is lessened too. 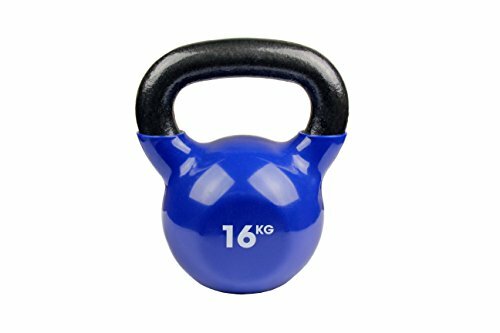 These are great value kettlebells from the dynamic Fitness-Mad brand. Check them out (along with the very positive reviews from previous buyers) at amazon.co.uk now. For years the kettlebell has been an essential part of the training and development for athletes, advanced gym-goers and martial artists. Its benefits are out there for all to see and now kettlebells are being incorporated into workouts for beginners and home gym users as well as the professionals. Working with kettlebells will help improve your grip and reach dynamic total-body movements, which will take your body to new heights. I done a little research online and found some great sites with workouts easily laid out and started with the beginner moves. I do recommend taking guidance from a personal trainer before you start working out with kettlebells – it is easy to get a pull or strain if your technique is not right. While some people might argue that all kettlebells are equal, these Fitness Mad ones will change your thinking on that. If you have ever tried working out with the thin, painted metal handles of traditional bells, then the vinyl and easy to grip handles are a big plus. Your floor will be protected by the vinyl base and the handle offers fantastic grip even after a long hard work-out. As well as burning fat and increasing cardio you will benefit from improved balance and agility. They may seem like a small piece of kit, but you can easily give yourself a challenging muscular and cardio workout. Burn fat fast and gain lean muscle in the process by adding the Fitness-Mad kettlebell into your training regime.